When you go to "edit page" view, and the "unlimited addons" plugin is enabled, the page is not loaded. WPBakery Page Builder produce very big json string with the defenitions of all the addons. If there are big amount of addons it can reaach up to 1.2MB. Some servers has configuration that not allow this like output. 1. 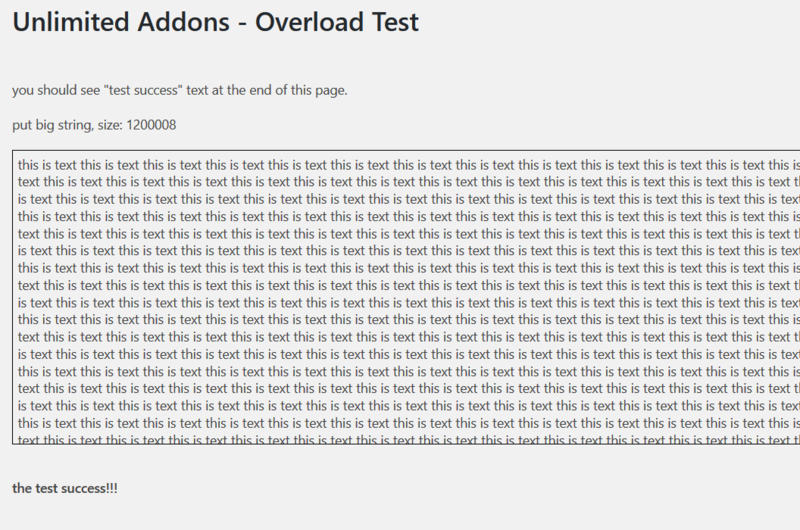 Make sure you have the latest version of unlimited addons plugin (1.0.12 and up). 2. Go to General Settings => Troubleshooting => Overload Test => and press on the button "Run Test"
If you don't see this picture, then you know that it's the current bug. Please tell them to run this test after they fix to make sure it's fixed. In order to talk effectively with the server support you can give them this simple php test file. This file should run successfully after the fix their bug. It's running on all the servers, it's very simple file, that puts 1MB string on html page. When they fix their part, you can ask them what they did, and help us to update this article.